Drug assays are performed by HPLC, which consists of a Waters 2690 Separation Module (or 2696), and a Waters 2996 Photodiode Array Detector. An Ultrasphere, C-18 (2), 5 μm; 4.6×150 mm column heated at 30° C. is used for separation and the detector is set at about 264 nm. The mobile phase is (10:90) MeOH-buffered mobile phase with a flow rate of 1 mL/min and a total run time of 12 min per sample. The buffered mobile phase may comprise (68:0.75:0.25:31) 13 mM 1-Heptane Sulfonic Acid, sodium salt-glacial acetic acid-triethylamine-Methanol. The release rates are determined by calculating the amount of drug being released in a given volume of medium over time in μg/day. Polymers which may be used in the implants can be obtained from Boehringer Ingelheim. Examples of polymer includes: RG502, RG752, R202H, R203 and R206, and Purac PDLG (50/50). RG502 is (50:50) poly(D,L-lactide-co-glycolide), RG752 is (75:25) poly(D,L-lactide-co-glycolide), R202H is 100% poly(D,L-lactide) with acid end group or terminal acid groups, R203 and R206 are both 100% poly(D,L-lactide). 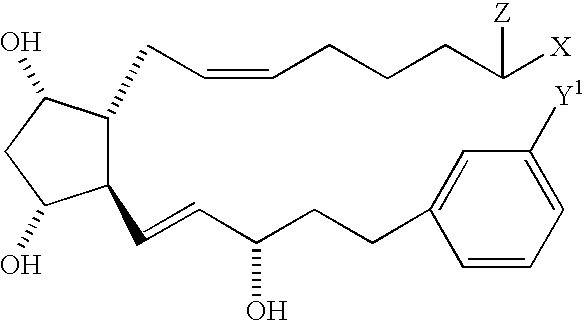 Purac PDLG (50/50) is (50:50) poly(D,L-lactide-co-glycolide). The inherent viscosity of RG502, RG752, R202H, R203, R206, and Purac PDLG are 0.2, 0.2, 0.2, 0.3, 1.0, and 0.2 dL/g, respectively. The average molecular weight of RG502, RG752, R202H, R203, R206, and Purac PDLG are, 11700, 11200, 6500, 14000, 63300, and 9700 daltons, respectively. 3. The implant of claim 1, wherein the prostamide component is dispersed within the biodegradable polymer matrix. 4. The implant of claim 1, wherein the prostamide component comprises bimatoprost provided in an amount of about 0.1% to about 90% by weight of the implant. 6. The implant of claim 1, wherein the matrix comprises a mixture of two different biodegradable polymers, each polymer selected from the group consisting of polylactic acid, polyglycolic acid, polylactide-co-glycolide, derivatives thereof, and mixtures thereof. 7. The implant of claim 6, wherein the matrix comprises a mixture of two different polylactic acids. 8. The implant of claim 6, wherein the matrix comprises a mixture of a polylactic acid and a polylactide-co-glycolide. 9. The implant of claim 1, wherein the matrix comprises a mixture of different biodegradable polymers, each biodegradable polymer having a different inherent viscosity. 10. The implant of claim 1, wherein the matrix comprises a mixture of different biodegradable polymers, each polymer having a different molecular weight. 11. The implant of claim 1, wherein the matrix releases drug at a rate effective to sustain release of an amount of the prostamide component from the implant for more than one month from the time the implant is placed in the vitreous of the eye. 12. The implant of claim 1, wherein the therapeutically effective amount of the prostamide component is an amount effective to stimulate aqueous humor outflow in the eye in which the implant is placed. 13. The implant of claim 1, further comprising a prostaglandin analogue. 14. The implant of claim 13 wherein the prostaglandin analog is unoprostone. 15. The implant of claim 1, further comprising an intraocular pressure lowering drug other than a prostamide derivative. 16. The implant of claim 1, wherein the implant is structured to be placed in the vitreous of the eye. 17. The implant of claim 1 which is formed by an extrusion process. "Lumigan found effective in early phase 3", Ocul. Surg. News Mar. 1, 2001;19(5):1,35. "Lumigan®: a new ocular hypotensive agent for achieving target intraocular pressures," Acta Ophthalmol Scand, Scientific Abstracts 2002; 80(4):457 (2002). "Tazarotene", Drugs Future, 2003; 28(2):208-209. Annual Update 2003: Dermatologic Drugs. Anderson et al., "An Injectable Sustained Release Fertility Control System", Contraception vol. 13, pp. 375-384, (1976). Baker, R., "Controlled Release of Biologically Active Agents", A Wiley-Interscience Publication, p. 73-75 (1987). Bito, L. Z. Biological Protection with Prostaglandins Cohen, M. M., ed., Boca Raton, Fla., CRC Press Inc., 1985, pp. 231-252. Bito, L. Z., "Prostaglandins, Old Concepts and News Perspectives" Arch. Ophthalmol. vol. 105, pp. 1036-1039 (1987). Bito, L. Z., Applied Pharmacology in the Medical Treatment, Drance, S. M. and Neufeld, A. H. eds., New York, Grune & Stratton, 1984, pp. 477-505. Bodor, N. et al.. "A comparison of intraocular pressure elevating activity of loteprednoletabonate and dexamethasone in rabbits" Current Eye Research 11:525-30 (1992). Brubaker, "Mechanism of Action of Bimatoprost (Lumigan(TM))", Surv Ophthalmol 45 (Suppl 4): S347-S351 (2001). Brubaker, "Mechanism of Action of Bimatoprost (Lumigan™)", Surv Ophthalmol 45 (Suppl 4): S347-S351 (2001). Busse et al., "Tyrosine kinase inhibitors: rationale, mechanisms of action, and implications for drug resistance", Semin Oncol 28(suppl 16) 47-55 (2001). Charles, et al., "Use of Bioerodible Polymers Impregnated with Mitomycin in Glaucoma Filtration Surgery in Rabbits," Ophthalmology, Apr. 1991, vol. 98, No. 4:503-508. Chen et al., "Lumigan®: A Novel Drug for Glaucoma Therapy", Optom in Pract, 3:95-102 (2002). Cheng C. K. et al.."Intravitreal sustained-release dexamethasone device in the treatment of experimental uveitis", Invest. Ophthalmol. Vis. Sci. 36:442-53 (1995). Coleman et al., "A 3-Month Randomized Controlled Trial of Bimatoprost (LUMIGAN) versus Combined Timolol and Dorzolamide (Cosopt) in Patients with Glaucoma or Ocular Hypertension", Ophthalmology 110(12): 2362-8 (2003). Conquelet et al, "Successful Photodynamic Therapy Combined with Laser Photocoagulation in Three Eyes with Classic Subfoveal Choroidal Neovascularization Affecting Two Patients with Multifocal Choroiditis: Case Reports", Bull. Soc. Belge Ophtalmol, 283, 69-73, 2002. David L. Epstein, "Primary Open-Angle Glaucoma", Chandler and Grant's Glaucoma, Lea & Febiger, 1986, pp. 129-181. Di Colo, "Controlled drug release from implantable matrices based on hydrophobic polymers", Biomaterials, vol. 13, No. 12, pp. 850-856 (1992). Fotsis, et. al., "The endogenous oestrogen metabolite 2-methoxyoestradiol inhibits angiogenesis and suppresses tumour growth", Nature 1994, 368, 237. Gilman, A.G., et al., eds. (1990). Goodman and Gilman's: The Pharmacological Basis of Therapeutics. 8th Edition, Pergamon Press: New York, pp. 1447-1451. Goel et al., "Tyrosine Kinase Inhibitors: A Clinical Perspective", Current Oncology Reports, 4:9-19 (2002). Guenther, Lyn C., "Optimizing Treatment with Topical Tazarotene", Am. J. Clin. Dermotol., 2003: 4(3):197-202. Hainsworth, Dean P. et al., Sustained Release Intravitreal Dexamethasone, Journal of Ocular Pharmacology and Therapeutics, (1996) vol. 12, No. 1, pp. 57-63. Haluska et al., "Receptor tyrosine kinase inhibitors", Current Opinion in Investigational Drugs, 2(2):280-286 (2001). Hare et al., "Efficacy and safety of memantine, an NMDA-Type Open-Channel Blocker, for reduction of retinal injury associated with experimental glaucoma in rat and monkey", Surv Ophthalmol 45(Suppl 3): S284-S289 (2001). Hashizoe, Mototane et. al. "Scleral Plug of BiodegadablePolymers for Controlled Drug Release in the Vitreous", Arch Ophthalmol. 1994;112 : 1380-1384. Heller, "Biodegradable Polymers in Controlled Drug Delivery", in: CRC Critical Reviews in Therapeutic Drug Carrier Systems, vol. 1, (CRC Press, Boca Raton, FL, 1987), pp. 39-90. Heller, Hydrogels in Medicine and Pharmacy, N. A. Peppes ed., vol. III, (CRC Press, Boca Raton, FL, 1987), pp. 137-149. Hoyng et al., "Pharmacological Therapy for Glaucoma", Drugs, Mar. 2000, 59(3):411-34. Hubbard et al., "Protein tyrosine kinase structure and function", Annu. Rev. Biochem., 69:373-98 (2000). Jampel, et al, "Glaucoma Filtration Surgery in Monkeys Using 5-Fluorouridine in Polyanhydride Disks," Arch Ophthalmol., Mar. 1990, vol. 108:430-435. Kimura, Hideya et. al. "A New Vitreal Drug Delivery System using an Implantable Biodegradable Polymeric Device", Invest Ophthalmol Vis Sci. 1994;35 : 2815-2819. Kochinke et al., "Biodegradable Drug Delivery System for Uveitis Treatment", Investigative Ophthalmology & Visual Science, Feb. 15, vol. 37, No. 3, (1996). Kwak, H.W. And D'Amico, D. J. "Evaluation of the retinal toxicity and pharmacokinetics of dexamethasone after intravitreal injection", Arch. Ophthalmol. 110:259-66 (1992). Lai et al, "Alpha-2 adrenoceptor agonist protects retinal function after acute retinal ischemic injury in the rat", Vis Neurosci, 19:175-185 (2002). Lee et al., "Glaucoma Filtration Surgery in Rabbits Using Bioerodible Polymers and 5-Fluorouacil", Ophthalmology, Dec. 1987, vol. 94, No. 12, pp. 1523-1530. Lee et al., "The Use of Bioerodible Polymers and 5-Fluorouracil in Glaucoma Filtration Surgery," Investigative Ophthalmology & Visual Science, Nov. 1988, vol. 29, No. 11:1692-1697. Marks, R., "Topical Tazarotene: Review and Re-Evaluation", Retinoids, 2001; 17(3):72-74. Miller et al., "Degradation Rates of Oral Resorbable Implants (Polylactates and Polyglycolates) : Rate Modification with Changes in PLA/PGA Copolymer Ratios", J. Biomed. Materials Res. vol. 11, pp. 711-719 (1977). Miller et al., "Synthesis and Structure-Activity Profiles of A-Homoestranes, the Estratopones", J. Med. Chem., 40:3836-3841 (1997). Olsen, T.W. et al. "Human scleral permeability: effects of age, cryotherapy, transscleral diode laser, and surgical thinning", Invest. Ophthalmol. Vis. Sci. 36:1893-1903 (1995). Phillips et al., "Efficacy of 0.1% Tazarotene Cream for the Treatment of Photodamage", Arch Dermatol, Nov. 2002, 138(11): 1486-1493. Phillips et al., "Penetration of timolol eye drops into human aqueous humour: the first hour", British Journal of Ophthalmology, vol. 69, pp. 217-218 (1985). Physician's Desk Reference, product information on "Alphagan® P", 54 Edition, (2000) pp. 493-494. Pribluda et al., "2-Methoxyestradiol: An endogenous antiangiogenic and antiproliferative drug candidate", Cancer and Metastasis Reviews, 19: 173-179 (2000). Quigley et al., "The mechanism of optic nerve damage in experimental acute intraocular pressure elevation", Invest. Ophthalmol. Vis. Sci. 19:505 (1980). Rao, N.A. et al. (1997). "Intraocular inflammation and uveitis", in: Basic and Clinical Science Course (San Francisco: American Academy of Ophthalmology, 1997-1998), Section 9, pp. 57-80, 102-103, 152-156. Renfro, L. et al. "Ocular effects of topical and systemic steroids", Dermatologic Clinics 10:505-12 (1992). Schuettauf et al., "Effects of anti-glaucoma medications on ganglion cell survival: the DBA/2J mouse model", Vision Res., 42(20):2333-7 (2002). Schumacher et al., "The Physiological Estrogen Metabolite 2-methoxyestradiol reduced tumor growth and induces apoptosis in human solid tumors", J Cancer Res Clin Oncol., 127:405-410 (2001). Skalka, H.W. et al. "Effect of corticosteroids on cataract formation", Arch. Ophthalmol. 98:1773-7 (1980). Smith et al., "Sustained-Release Subconjunctival 5-Fluorouracil", Ophthalmic Surgery and Laser, Sep. 1996, vol. 27, No. 9, pp. 763-767. Starr, M. S., "Further Studies on the Effect of Prostaglandin on Intraocular Pressure in the Rabbit", Exp. Eye Res., vol. 11, pp. 170-177 (1971). Tracy et al., "Factors affecting the degradation rate of poly(lactide-co-glycolide) microspheres in vivo and in vitro", Biomaterials, vol. 20, pp. 1057-1062 (1999). Watson et al., "A Six-month, Randomized, Double-masked Study Comparing Latanoprost with Timolol in Open-angle Glaucoma and Ocular Hypertension", Ophthalmology vol. 103:126-137 (1996). Wheeler et al, "Role of Alpha-2 Agonists in Neuroprotection", Surv Ophthalmol, vol. 48 (Suppl 1): S47-S51 (Apr. 2003). Wheeler, "Experimental studies of agents with potential neuroprotective properties", Acta Ophthalmol Scand, 77(229):27-28 (1999). WoldeMussie et al., "Neuroprotective effects of memantine in different retinal injury models in rats", J Glaucoma 11(6):474-480 (2002). WoldeMussie, "Neuroprotection of retinal ganglion cells in experimental models of glaucoma", Minerva Oftalmol, 42(2):71-8 (2000). Woodward et al., AGN 192024 (Lumigan®): A Synthetic Prostamide Analog that Lowers Primate Intraocular Pressure by Virtue of Its Inherent Pharmacological Activity, ARVO 2002;(CD-ROM):POS. Woodward et al., The Pharmacology of Bimatoprost (Lumigan(TM)), Surv Ophthalmol 45 (Suppl 4) S337-S345 (2001). Woodward et al., The Pharmacology of Bimatoprost (Lumigan™), Surv Ophthalmol 45 (Suppl 4) S337-S345 (2001). Zhou, T., et al. "Development of a multiple-drug delivery implant for intraocular management of proliferative vitreoretinopathy", Journal of Controlled Release 55: pp. 281-295.